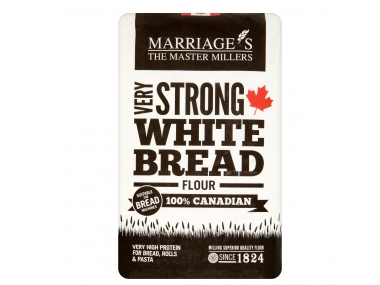 Buy Marriages Very Strong White 100% Canadian Bread Flour 1.5kg in the UK from our online shop or directly from our independent Scottish store. Very high protein for making high quality bread, rolls & pasta. Our Canadian flour produces a very strong, pliable dough, due to its superior protein content. Ideal for bread making by hand or using a bread maker. We sell real Marriages and other Other Flours directly from our shop in Scotland and online throughout the UK. View more products from Marriages. Where can you buy real Very Strong White Flour safely online? If you are wondering where you can buy Marriages Very Strong White 100% Canadian Bread Flour 1.5kg safely online in the UK, then shop with us. Very Strong White Flour - Marriages Very Strong White 100% Canadian Bread Flour 1.5kg in Other Flours and Baking.